Gloria Nickerson and Kyler Zeleny, Organizers. “Visual Exhibition” of The Visual Sociology and Methodologies Research Cluster. The Canadian Sociology Association Annual Meeting at the Congress of the Social Sciences and Humanities held at the University of Ottawa, June 2015. – the study of the purpose and the meaning of image-making practices like recreational and family photography. These approaches can be narrowed down into three main methodological threads: 1) using cameras and other devices to collect visual data, 2) studying visual artefacts and information as a significant part of research, and 3) relaying information with visual mediums rather than, or in addition to, written or oral modes of communication. Looking around the room where members of the Research Cluster had displayed their work, I could see seven exhibits—six adorning the walls with a seventh projected on a screen at the front. Each was accompanied by a brief note by the curator. Some researchers used the medium of photography as a research tool. 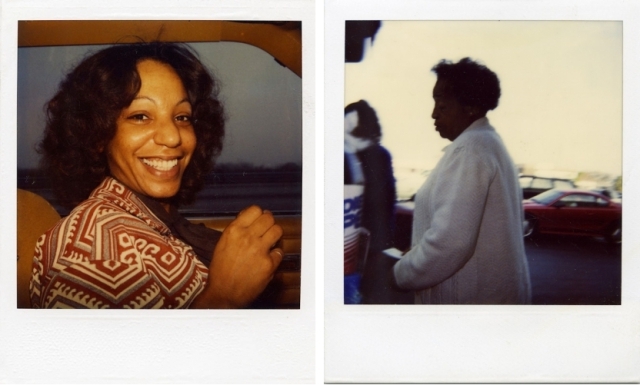 Others, as in Kyler Zeleny’s “Found Polaroids” exhibit (www.kylerzeleny.com), treated the photographs, found in archives or in pawns shops and junk stores, as the material traces and records of past lives and old communities. In what follows, I take a virtual walk around the room and describe each project before considering the exhibit as a whole. 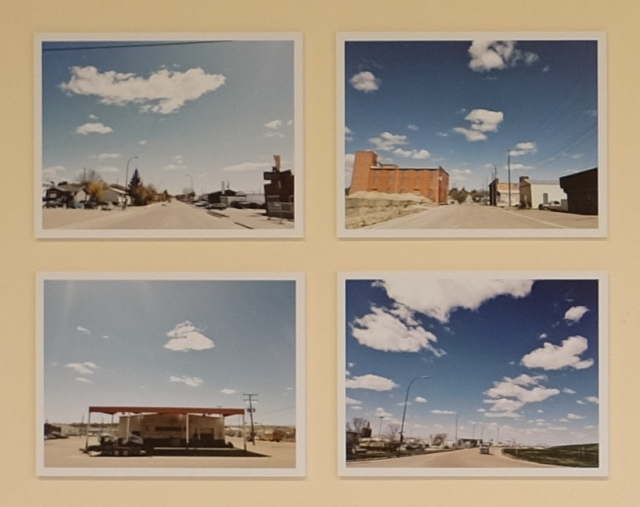 The entry “Out West,” curated by Zeleny, , takes the rural west as its subject. Small rural communities nestle under the big prairie sky, bifurcated by the highways that cut across the plains. The highway becomes a kind of measuring implement that gauges how far one can really see and that could, in the mind of the viewer, tie the rural to larger urban centres. The curatorial commentary stressed that these images are not some forgotten relics of Americana, but hail from the Canadian West and that they are documents of our present. The next exhibit lingers in the Canadian West. 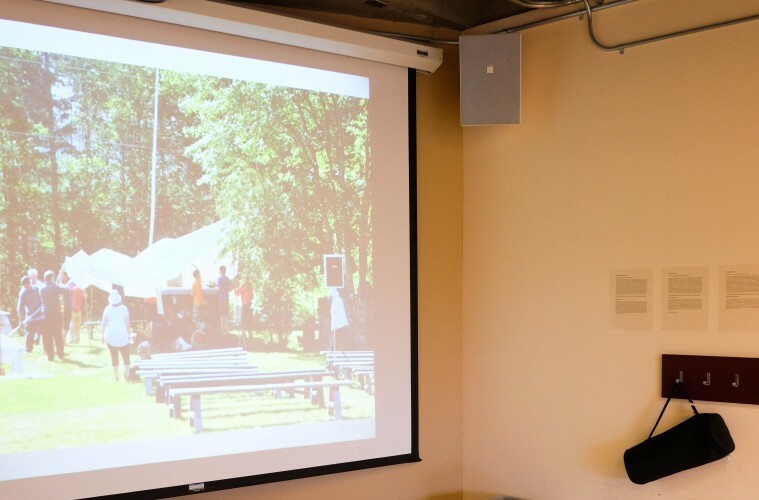 Dr. Liza McCoy, a sociologist from the University of Calgary, has been collaborating with Dr. Barbara Schneider (also at the U of C) in a research project that engages the square dance community. They are particularly interested in the gendered and embodied practice of square dance—both in terms of its collaborative form and the age of the community members (mostly elderly). 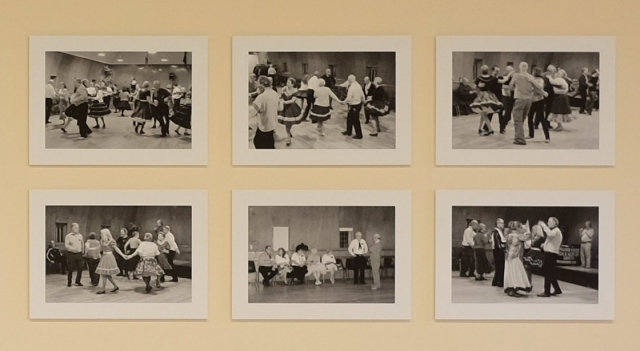 McCoy’s photographs suggest the boundaries of the square dance hall as the boundaries of the community. Those present in the hall who are not dancing watch. Everyone takes part in shaping the community. One can picture these figures driving along the roads and filling up their tanks at the pumps from the previous exhibit. 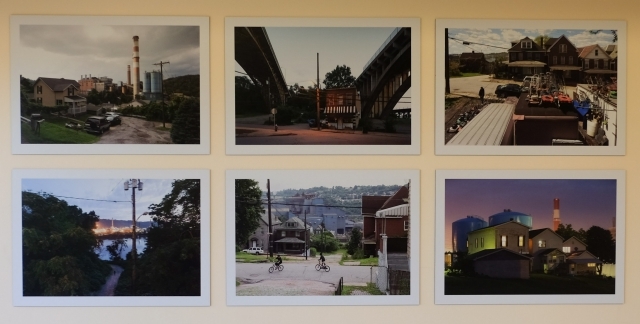 In an entry curated by Zeleny, photographs by David Schalliol (http://davidschalliol.com)—a Sociology PhD Candidate at the University of Chicago—render visible Pennsylvanian towns that have been obscured in the shadows of industrial operations. Schalliol cites the 1948 Smog disaster in Donora, where 20 were killed, as one of the inspirations for the photographs. Smoke stacks tower over homes and children ride under power lines. These images raise the question, who, or what, is the subject of these photographs? Seemingly in response to the questions raised in Schalliol’s work, “Photography as Sense-Making Practice,” another entry curated by Zeleny this time with photographs by photographer-researcher Andriko Lozowy (http://www.artsrn.ualberta.ca/alozowy/), utilizes the combination of images and a text guided by questions develops methodological claims about Visual Sociology. The accompanying text asks: “Who am I, to photograph?”, “What do images do?”, and “Where to gaze with a camera?” These questions and the meditations that follow them frame visual sociology as an intervention into and reflection on community. The final claim in the write up suggests that “images…work for me…to ensure that like a few moments of inward meditation, photography-research can help to make even the most incoherent sensorial experience, just flat enough, for just long enough, to make some sense” (text from exhibit). In light of this, we can read both Schalliol’s and Lozowy’s images as temporal “moments” that arrest the subject as much as anything else captured within the frame of the photograph. 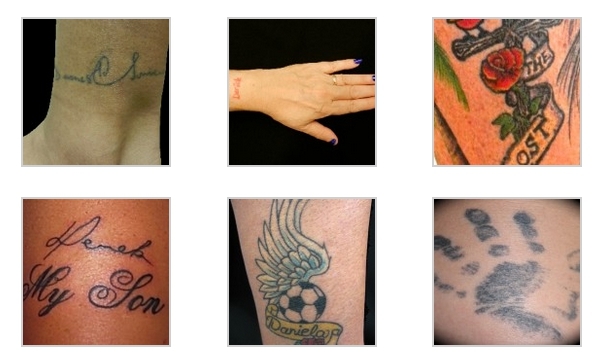 Turning from infrastructure to mourning, York University’s Dr. Deborah Davidson’s current research project looks at the ways grief gets embodied through the visual medium of tattooing (http://ctc.apps01.yorku.ca/). Davidson’s work uses photography to preserve the mourning, memorial, and remembrance of tattooed bodies in order to study the relation between the material ephemerality of loss and the permanence of ink. When looking at Davidson’s archive, one cannot help but think when we die the marks we have made on our bodies endure until our own end—they die with us. The “Picturing Diversity” exhibit, run by Dr. Cathy Holtmann, Dr. Nancy Nason-Clark, Gloria Nickerson, and Jolyne Roy—all at the University of New Brunswick—and the project (http://religionanddiversity.ca/) each deploy the visual as a tool for teaching and learning about the entanglements of religion and immigration in community. These photo essays span a range of topics from domestic violence, immigrants, religious discrimination, pilgrimage, identity formation, sexual diversity, and religion and technology. One striking aim of the project is to use photography and film to empower researchers and participants alike. Here, the visual provides a method of study and tool that participants can use to express themselves and to experience difference. Each of these approaches use the visual in some way to capture something vital to the research. The visual becomes a part of the methodological apparatus in a way the bolsters the connections between researcher, participant, and community. One connection that I cannot ignore is the way these photographs, considered together, reveal something that cuts across most of these projects: the photographic background. By foregrounding the dancers in the hall or the children riding bikes along a rural street, these photographers and visual sociologists allow us to see also the background—the square dancers need to drive to hall, the massive infrastructure of highways dwarfs the bicycle riders, and the small western rural community needs the vital link to the urban centre. The topics the project threads through are wide and varied. They include: object-journeys, the legacy of instant photography, the morality and legality of sharing and reproducing the images of others (without their consent), the changing understanding of ‘found photography’ as a category, the death of the physical photo album, and the image fetishism of physical images in a digital world. 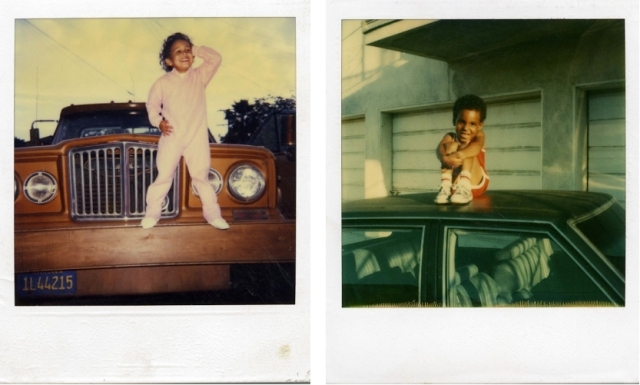 The background of these Polaroids springs to the surface when viewed in the same room as Zeleny’s other exhibit “Out West.” People pose in front of cars, sit in them, or stand on them. In a sense, this archive captures the background of petroleum that appears across the registers of Zeleny’s concise articulation of what this archive offers to sociologists and other cultural theorists more broadly. But the central difference between Polaroids and their digital legacies—Instagram, Snapchat, Vine, and so on—lies in their remarkable physical presence and, it turns out, surprisingly light ecological footprint. The Guardian recently featured an article by Nicholas Mirzoeff who writes, “In 2014, 1tn photographs were taken, more than a quarter of all previously existing photos” (Mirzoeff), which account for only a fraction of the massive amount of energy consumed annually for digital storage. Another observation will help to drive home the comparison. Mark P. Mills has recently revealed a shocking fact: “Although charging up a single table or smart phone requires a negligible amount of electricity, using either to watch an hour of video weekly consumes annually more electricity in the remote networks than two new refrigerators use in a year” (Mills 3). Today, we are producing more images than ever before and yet, at one and the same time, we are hard pressed to see the impact this is having. In spite of the invisibility of the energy demands made by our intensely digital, visual culture, these exhibits capture traces of its infrastructure and participate in its wonderfully generative, possibilities. Visual Sociology develops from within this culture. Those interested could also look to books like Jon Prosser’s Image Based Research (1998) and Douglas Harper’s Visual Sociology (2012). Indeed, Visual Sociology has been making a name for itself thanks to the IVSA and to Goldsmiths MPhil and PhD programs (http://www.gold.ac.uk/pg/mphil-phd-visual-sociology/) but also thanks to the collaboration of researchers like the ones profiled above. Hopefully, the Research Cluster will expand its exhibition and host a few more panels at Congress next year; given the opportunity, I would certainly attend. This year, at the exhibition I learned that Visual Sociology is as much about using new tools to investigate and re-present the world around us as it is about encountering objects of daily life in a new light. Brent Ryan Bellamy is a SSHRC Postdoctoral Fellow at the Memorial University of Newfoundland in St. John’s. Mills, Mark P. The Cloud Begins with Coal: Big Data, Big Networks, Big Infrastructure, and Big Power. August 2013. Web. 20 July 2015. Mirzoeff, Nicholas. “In 2014 we took 1tn photos: welcome to our new visual culture.” Theguardian.com. 10 July 2015. Web. 20 July 2015.